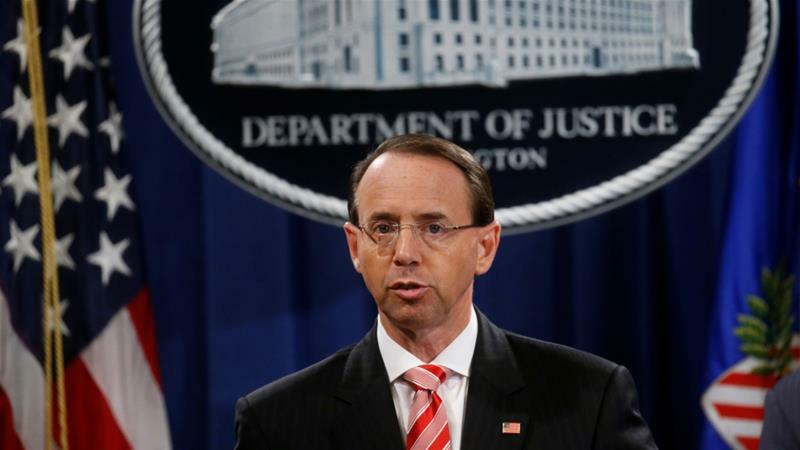 Conflicting reports have surfaced on the possible resignation or firing of US Deputy Attorney General Rod Rosenstein, who oversees the special counsel investigation into Russia’s role in the 2016 presidential election. According to US media, Rosenstein was meeting with White House Chief of Staff John Kelly after reports surfaced that he had offered to resign in speculation of being fired. Axios, citing an unidentified source with knowledge of the matter, reported that Rosenstein verbally resigned to White House Chief of Staff John Kelly. A second source told the news outlet that Rosenstein is “expecting to be fired” so he plans to step down. The Wall Street Journal, citing an individual familiar with the matter, reported that Rosenstein has not submitted his resignation. NBC News reported that Rosenstein said he would not resign and the White House would have to fire him. Reuters news agency, also citing a person familiar with the matter, said Rosenstein had not resigned and is still serving as US deputy attorney general. The news agency reported that the unnamed source confirmed that the deputy attorney general had a previously scheduled meeting at the White House on Monday and that the Axios reports were false. The reports come as Trump faces mounting pressure from the investigation by Special Counsel Robert Mueller, who is looking into Russia’s role in the 2016 presidential election. Rosenstein assumed supervision of the investigation after his boss, Attorney General Jeff Sessions, recused himself because of his own contacts with Russia’s ambassador to Washington while serving as a Trump campaign adviser became public. There was widespread speculation that Trump would fire Rosenstein after a New York Times report on Friday said in 2017 he had suggested secretly recording Trump and recruiting Cabinet members to invoke a constitutional amendment to remove him from the office. The newspaper said none of those proposals came to fruition. Rosenstein denied the report as “inaccurate and factually incorrect”.